ISLAMABAD, Apr 15 (APP):Prime Minister Imran Khan on Monday emphasized that Pakistan and the United Kingdom should enhance the existing ties into long-term and multifaceted strategic partnership especially post-Brexit. Terming Pakistani diaspora a connecting bridge between the two countries, the prime minister expressed satisfaction that the British Pakistanis were contributing positively to the British society. 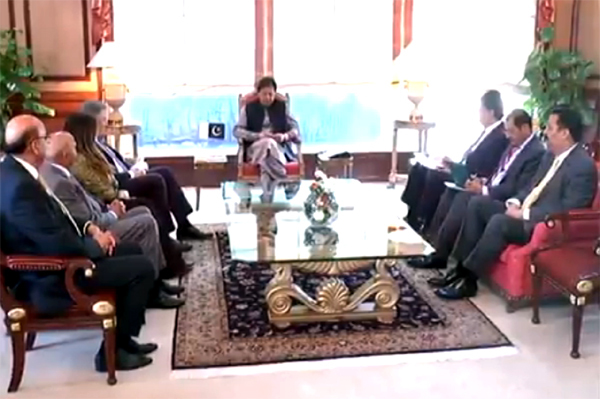 Prime Minister Imran Khan also gave an overview of the regional situation, especially India and Afghanistan. He said Pakistan wanted peaceful relations with all its neighbours and resolve all issues through dialogue. He also highlighted the grave human rights violations committed by the Indian forces in Indian occupied Kashmir on daily basis. The prime minister said Pakistan and the UK had longstanding relationship, based on historical linkages and shared perceptions on a broad range of regional and international issues. Pakistan considered the UK a major trade and investment partner in the Europe. The Chairman of the Conservative Party agreed with the prime minister that irrespective of Brexit, both Pakistan and the UK had great potential to strengthen trade and investment ties. He lauded the leadership of prime minister in handling the post-Pulwama situation. He reiterated the invitation by British Prime Minister Theresa May to Prime Minister Imran Khan to visit the UK at a mutually convenient date.